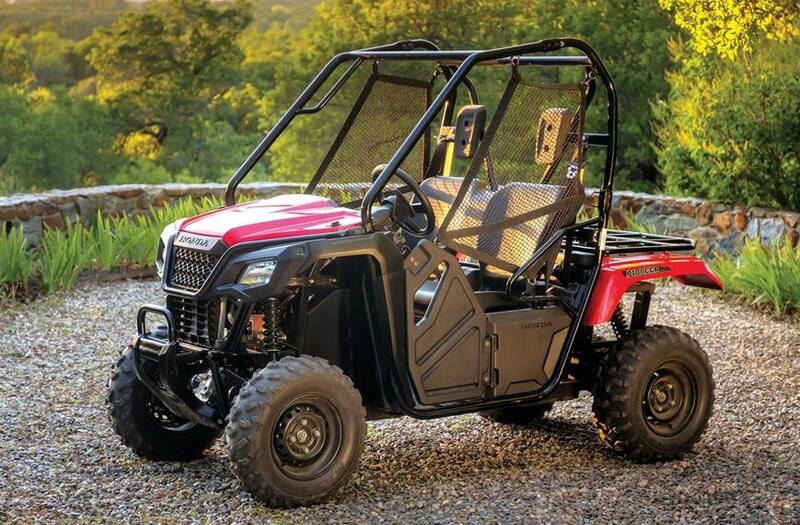 Efficient power: The Pioneer 500’s liquid-cooled engine is mounted longitudinally in the frame, allowing direct driveshaft alignment to front and rear drive units for improved power output at the wheels. 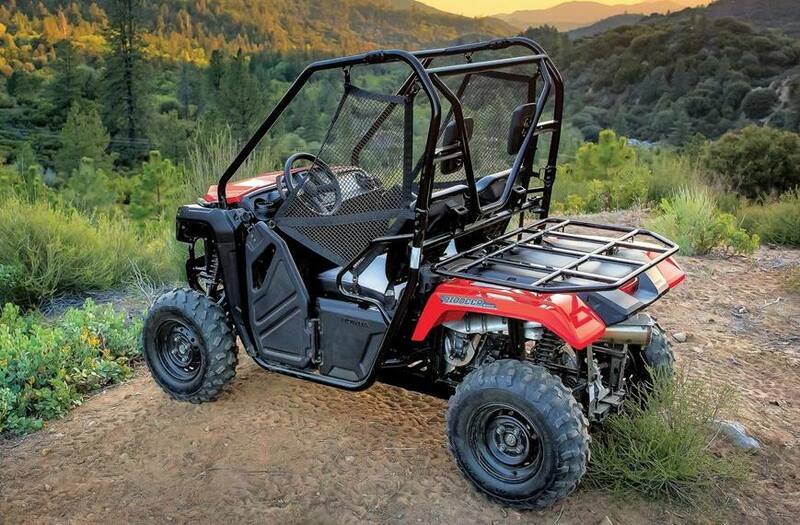 Tackle any terrain: Shiftable 2WD/4WD system provides the efficiency of two-wheel drive while retaining the ability to select 4WD quickly via a dash-mounted lever when conditions demand. Plus, the super-heavy-duty automatic clutch with low-rpm engagement contributes to excellent drivability and towing capacity. Advanced transmission: The addition of the automatic shifting function gives you the best of both worlds. Choose AT mode for fully automatic shifting, override the AT settings on the fly with paddle shifters mounted on the steering wheel, or choose MT mode and operate the five-speed transmission manually with the paddles. It’s the best of all worlds. Crisp performance: Electronic fuel-injection system provides crisp performance and helps ensure trouble-free starting and operation in cold conditions and changing altitudes. 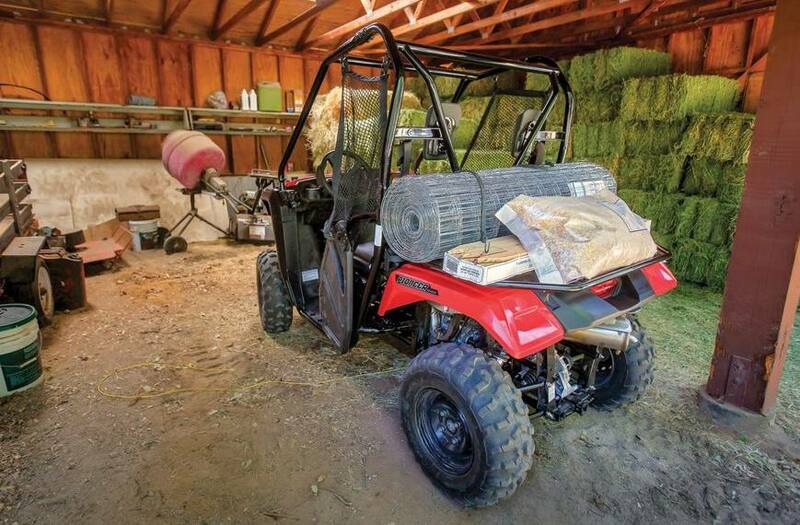 A convenient electric starter allows in-gear starting when the brake is applied. Quiet operation: High-mounted snorkel draws cleaner, drier air and features four separate resonators to reduce intake noise. A stainless steel exhaust system provides superior corrosion resistance and minimizes noise levels. The muffler includes a certified spark arrester for when you’re riding in regulated or sensitive environments. 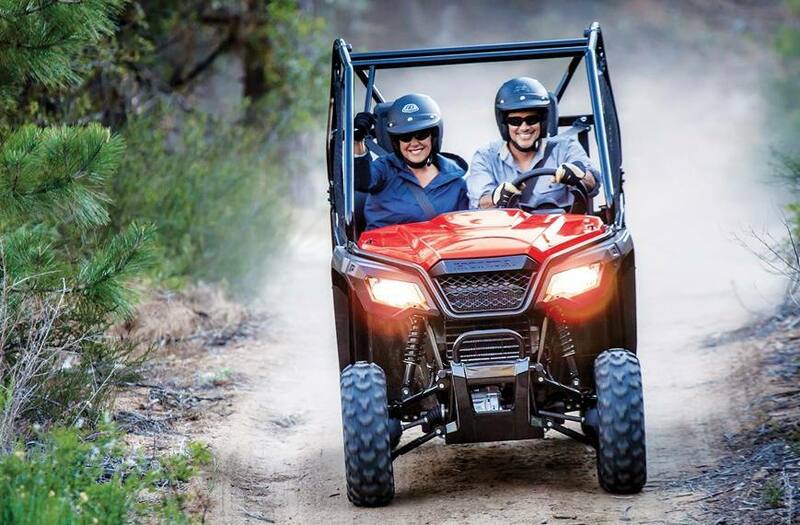 Trail ready: Because it’s physically smaller with a smaller wheelbase, narrower width and tighter turning circle than typical side-by-sides, the Pioneer 500 can go more places. 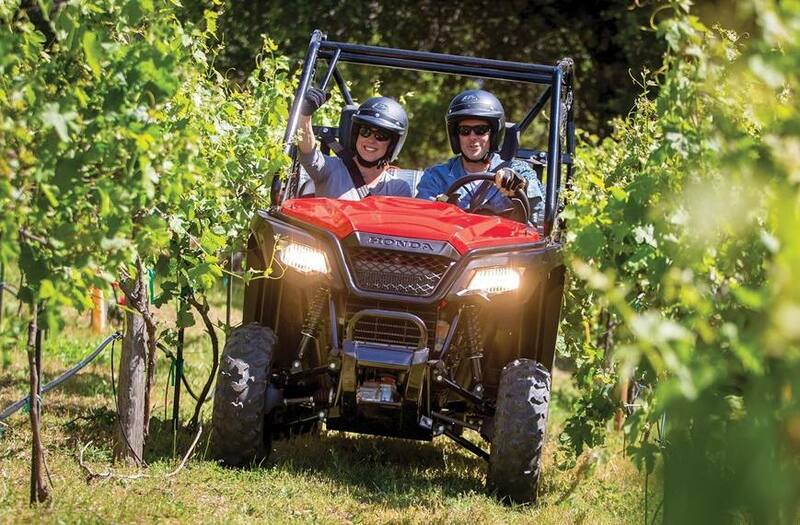 Handling & comfort: The independent front and rear suspension systems, with dual-rated springs provide a comfortable, controlled ride over all types of terrain. Dynamic control: With 149 mm (5.9 in.) of travel on all wheels, plus 243 mm (9.6 in.) 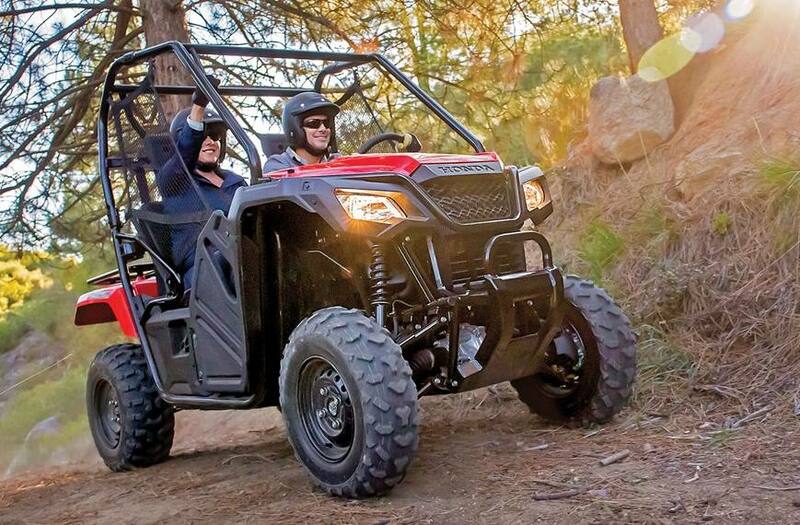 of ground clearance, the Pioneer 500 can negotiate difficult terrain with ease. And the suspension is tuned for a fun, sporty ride. Roomy seating: Roomy cab and bench seat are designed for a comfortable fit for two. Automotive-type 3-point Emergency Locking Retractor (ELR) seat belts and stout Occupant Protection Structure help to keep driver and passenger secure. For added safety, a speed limiter prevents travel faster than 24 km/h if it detects that a seat belt isn’t being worn. 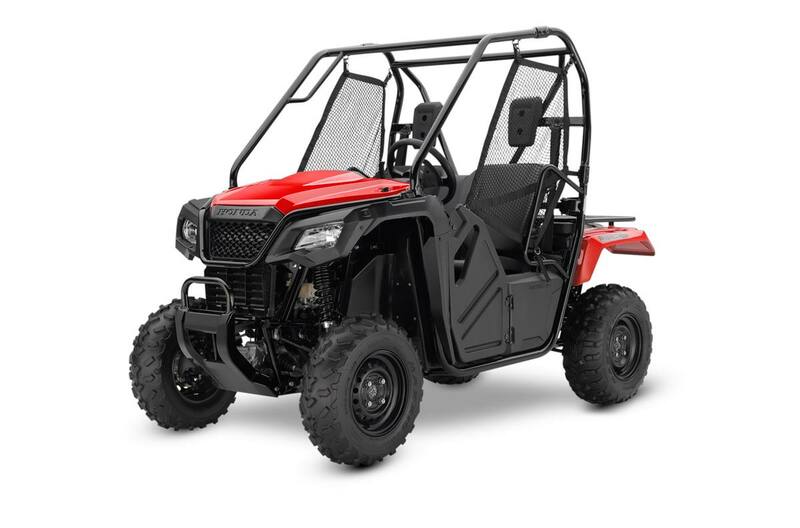 Cargo capacity: Large, flat cargo area with ATV-style rack offers numerous tie-down points for maximum load versatility and can carry 203 kg (450 lbs.) of gear. Towing ability: Heavy-duty receiver-style hitch lets you tow up to 450 kg (1,000 lbs.). 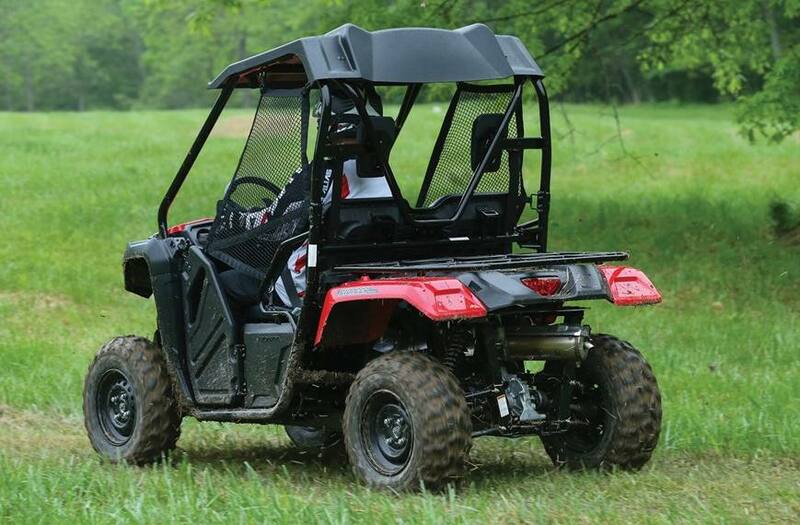 Built-in security: Doors feature a single-handed twist-action release mechanism, equally accessible from both inside and outside the Pioneer 500. Auto-style double latches allow the doors to latch securely when pulled shut. Bright illumination: Twin-headlight system features 37.5-watt headlights with a focused light distribution pattern for improved visibility after dark. LED brake lights and taillights provide optimal illumination and conspicuity. The easy-read digital dash includes a large speedometer, gear position indicator, fuel gauge, maintenance minder, and warning lights for critical engine and drivetrain functions. Use of this product must comply with all rules and regulations applicable to the region in which the product is used. Please consult your local dealer for more information. Specifications, features, illustrations and equipment shown are believed to be correct – however, accuracy cannot be guaranteed. Honda Canada Inc. reserves the right to make changes at any time, without notice or obligation, in colours, specifications, accessories, materials and models. Some vehicles are shown with optional equipment. Some vehicles shown are U.S. or European models. Canadian specifications and models may vary.